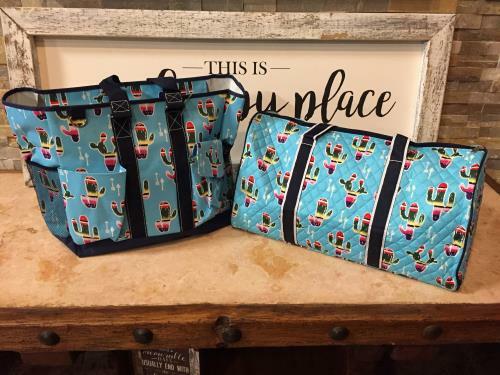 Both of these bags are super cute in material with bright blue and colored cactus. Left bag is the large organizer it has 2 mesh pockets on the sides, 2 open pockets in the front and 2 on the back. The duffel bag is quilted material with 1 zipper pocket on the outside and includes bows that clasp around the straps for a little something extra. Large Organizer: 19"x 13"x 8"
Duffel Bag: 19"x 12"x 12"